The new format Horizon labels first used at Europhilex in May have been reported in trial use from several parts of the country. This example used from Edinburgh on 20 July has been provided to me. I'd be interested in having pictures of other examples - and if they are in use in your area, please email me! 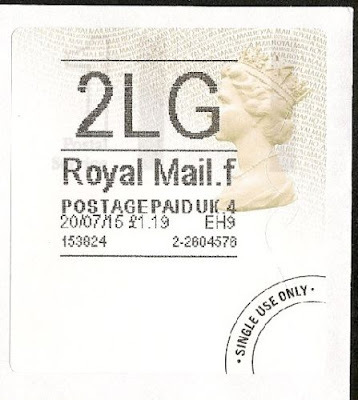 "national distribution of the new labels starts from Monday 14th Sept and "go live" is Monday 21st Sept."
It will be interesting to see whether the design has changed at all (as was suggested to me at Europhilex), or whether the black text will be changed. As the latter would probably involve a complete change of printers on the 11,500-strong branch network, I don't think that will happen yet. I suspect full roll out will start in September. I was going to order more Horizon labels this week but the reorder system advised to minimise reorders to prevent excessive local destruction as a new label is becoming available. To confirm, national distribution of the new labels starts from Monday 14th Sept and "go live" is Monday 21st Sept.